Flight Simulator X can help you earn, and keep your Instrument Rating. Microsoft’s Flight Simulator X is an under recognized, easy to use masterpiece. If you are training for your instrument rating, or are looking for a less expensive way to practice IFR procedures, keep reading. Flight Simulator X is a virtual Flight Simulator that can be used as a video game for people who like to mess around with airplanes on their computer. However, it can also be an invaluable resource to training G.A. pilots, or pilots who are looking for an alternative method to practice their cross-check and keep their instrument skills proficient. This is the fundamental skill of instrument flying. Also known as Instrument Attitude flying, developing an instrument cross-check is the very basic skill required to keep your airplane flying straight and level, and in the correct direction in IMC. It is the reason why your instrument training will begin with you practicing turns, climb/descents, stalls, and slow flight before moving onto approaches, and cross country flying. 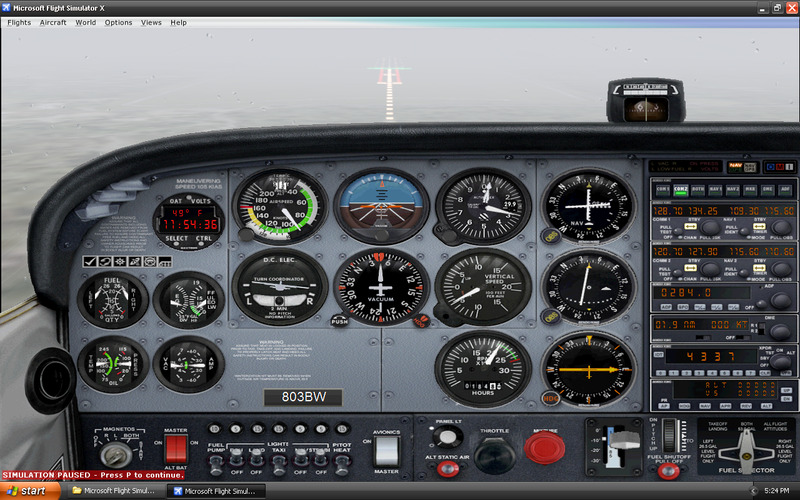 If you are new to instrument flying, or haven’t flown IFR in a while, Flight Simulator X can be a remarkable substitute for either an airplane or an AATD. All the instruments work exactly as they would in real life, allowing you to manipulate the airplane in all three axes with real time indications on the instruments. Here is a picture of a basic 6-pack in FSX. All the instruments work exactly the same way as a real airplane. An awesome feature in Flight Simulator, is the user’s ability to fail hundreds of different pieces of equipment on the airplane. During instrument training, we are constantly forced to fly the plane partial panel in case of a vacuum loss. In this picture, you can see the result of a vacuum loss on the instruments. Flight Simulator X allows you to fly almost any approach you’d like to practice! From an RNAV/GPS to the old school NDB approach, FSX allows you to fly almost all of the real world approaches that exist today. In my oppinion, one of the hardest parts of IFR training was tackling the notorius VOR DME arc. In FSX, not only can you practice the “turn 10 twist 10” technique, but you can also see how close you stayed on course from a top down perspective using the map feature. Here is a top down look of my flight path over the ground. My flight was a departure from KEWB to KPVD via a direct flight inbound towards PVD VOR, then turning into a Southeast 10 DME arc to intercept the ILS 5 approach into the airport. The magenta line outlines the 10 mile radius of Providence’s Class C airspace. The red line is my flight path. With very low visibility, I made this approach very challenging for myself. I made the visibility just at minimums so I would have to make a quick go/no go decision on whether to begin the missed approach at DH. In this case I was able to keep going. Here is something you can’t do in real life. Control the weather! 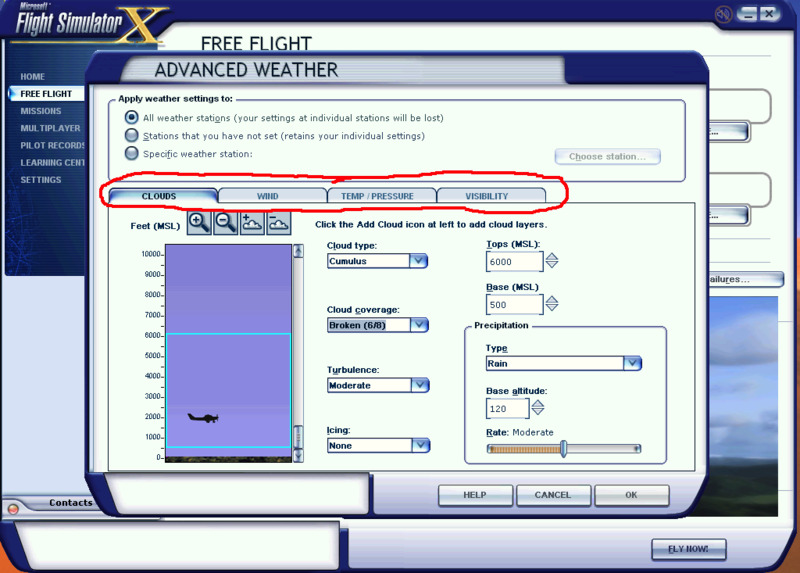 FSX allows the user to create their own weather. If you go into the advanced weather mode, you can not only pick if you want clouds or not –but you can control the exact height of ceilings, layers, types of clouds, visibilities, temps/dewpoints, barometric pressures, wind (including different levels of turbulence) different forms of precip, and so on. Here is the tool bar for advanced weather. It allows you to select whatever conditions you would like in any part of the world. Along with choosing what kind of weather you would like, you can also choose what time of day you are flying, and what season it is during the year. If that isn’t enough variability to toss in your flight, you can also control how much traffic there is in the air, on the roads, and in the sea. Yes, the sea. You can go overboard if you want. Que buh-dum-ch percussion noise. Instrument flying isn’t just about tuning radios and flying in clouds. Instrument pilots must be in constant communication with air traffic control from the time they enter a movement area, to the time they have landed and are ready to park. Flight Simulator incorporates a realistic ATC environment, providing IFR clearances, takeoff and landings, vectoring, ect. 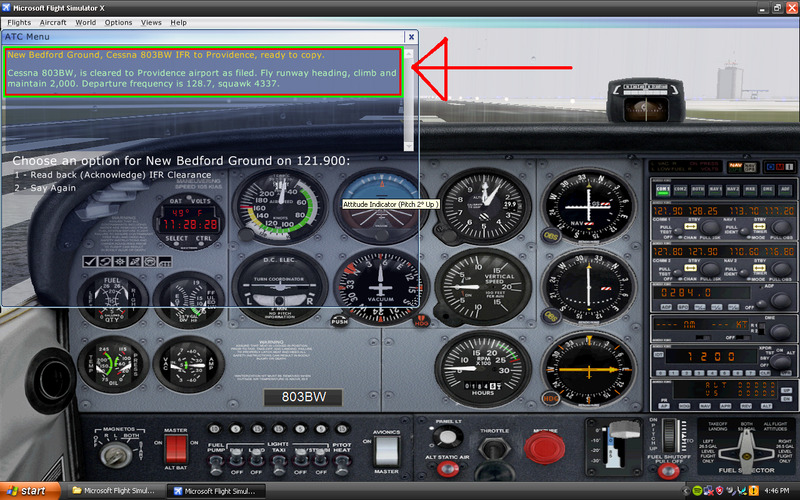 If you have a hard time copying an IFR clearance into “CRAFT” or “CVMEDS” FSX can help you practice this procedure. All you have to do is file a flight plan before you start up, then request it on the ground before you takeoff. Before you know it that fast talking controller will be no problem for your unstopable IFR clearance copying skills. Looking at Flight Simulators ATC translucent window. If talking to an imaginary computer ATC robot isn’t your cup of tea, you can join an online community called Boston Virtual ATC. BVA for short, this is an organization of hundreds of pilots, as well as real world air traffic controllers, who fly with eachother in a virtual environment -on FSX! Pilots fly in the server BVA provides, and are able to receive real time voice communication with other people in the server. This means it is almost the same thing as talking to real world controllers, without the risk of a real life scenario. It costs no money to join, however, you must pass a moderately challenging exam to be accepted into the community. This way, BVA can select people who actually know how to fly IFR procedures and communicate with ATC in a real world process. It generally costs around 120-150 bucks an hour to rent a single engine airplane depending on where you go. Some flight schools charge you almost that much to use their AATD devices, which can be pretty bogus and may lack a simulated ATC system. To purchase Flight Simulator X, it costs about 60 dollars. You will need a joystick with it, which will cost about 30 dollars. For less than 100 bucks, you can practice IFR procedures in the comfort of your own house, as much as you want, whenever you want, even when the weather is bad. You can also communicate with real world pilots and air traffic controllers in online communities within FSX to sharpen your IFR abilities. Flight Simulator X is not the only means of practicing IFR procedures at home. FSX is only for Windows. If you have an Apple, you can get X-Plane 9, or 10. I have personally never used X plane before, but it is most likely very similar to Window’s FSX. Posted in Flying Tips & Tricks, For Flight Instructors, For Pilots, Make Your Training Easier! Great article! Didn’t realize simX was that cheap, and useful. I think I’ll go get a copy! Thanks for a great blog guys!